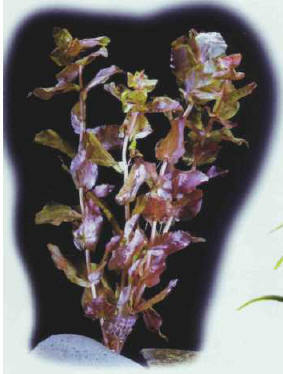 The leaves of these species are reddish in color, especially on the underside, but their shape varies according to the setting. They grow in soft, acid water, under strong lighting, and need plenty of iron. The formation of adventitious roots makes it easy to take cuttings. They can produce a striking visual effect if they are planted in a grove, as they stand out well against green plants. 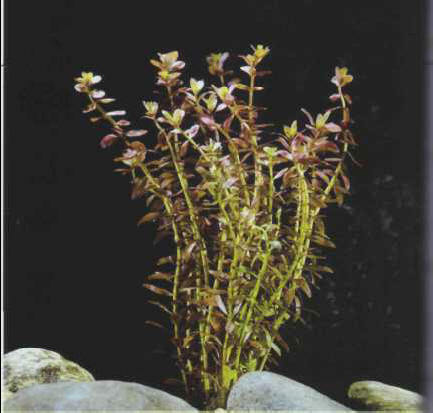 The coloring of the giant red rotala varies according to the intensity of the lighting, but, as is name suggests, red usually sets the tone. It grows quite quickly, but pruning encourages the growth of lateral shoots which can be used for cuttings. Size: 30 cm. The upper face of the leaves of the round-leaf rotalia is green, the lower one a reddish color. When the leaves emerge from the water they turn completely green. It is beautiful in clumps, though you must leave sufficient spaces between the stems when planting. Size: 30 cm.